If I was trading a lot of highly speculative positions then this might not be a huge milestone. Typically highly speculative positions have large betas and there will be larger gains as well as larger losses to balance that out. 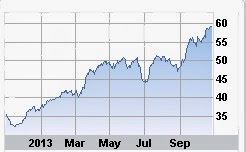 However, I have an unrealized 100%+ gain in one of my long-term DG stocks that I bought just last year! Capital gains are secondary to dividend income but it’s still something I want to see happen. That’s right, one of my best trades last year was picking up shares of Walgreen’s (WAG) on weakness. It was back around June of last year when they had some issues with their Express Scripts deal and also announced they were buying out Alliance Boots. I decided to pick up some shares on weakness. Their 52-week chart is at the top of the page. On June 20th of 2012 I bought 68 shares @ 28.99/share. Shares are currently trading over $59/share! That original post that includes some puts I sold also can be found here. My only regret is that I didn’t buy more shares. I’m actually due to add more to the company and probably will if prices ever come down a little. My average cost will still be well below where shares are trading at. I have no plans of selling shares. Has anyone else had this type of success with any of their holdings? Nice Pick. That’s a great return. Congrats. Thanks! Hopefully it won’t be the last with that kind of return. Congrats on the double! I didn’t get in on WAG early enough but I’m still sitting on a 64% gain. I’ve got a double from BAC and PSX and I’m working on one with EOG (89%). I didn’t start investing until 2011 so I’m pleased with the results so far, although I wish I was at the current point in my investing process when 2008/9 started to come around. Thanks, 64% is still great. I really screwed up by selling PSX after they split off. I’m still kicking myself. Oh well, you live and learn. You definitely made some nice pickups. Congrats. I jumped out of WAG near it’s previous high of $42. Clearly it broke out and I’m glad you caught it AAI. Have a great week. Thanks. I really don’t plan on selling any of my DG holdings unless their portfolio weight is too high. Take care! Nice one! I passed on two opportunities that would’ve produced 100% gains by now: WAG and V. Hopefully I’ve learned my lessons from those decisions. I don’t have any 100% gainers yet, but a few stocks have done very well for me, the top 3 being ABBV (up 79%), ITW (up 84%), and MDT (up 77%). Yeah I missed out on V too but I think it still has a long ways to run. Those are some really impressive gains on those three stocks. I’m sure you’ll have a 100% gainer soon especially if this market keeps going up. I wish you more picks like this one! That’s a good point. The 100% gain does not include dividends. I’m strictly going off my cost basis and since I don’t DRIP then it’s off my original purchase amount. That’s a really nice gain on JNJ. That’s fantastic for just more than a year! Congrats! 125% is still 125%. Congrats and you are doing well having just started out. 30%+ gainers in under a year is great. Nice job picking up some shares on the cheap. Thanks for sharing. Congrats! Well done. I passed up on WAG when it hit the skids. BIG mistake! Thanks! Yeah I screwed up by not holding onto PSX. I had also looked at ITW before it had run up so far and I missed out. I also had some HGIC, that was a nice profit from the buyout. If you don’t have a 100% gainer then I bet you are pretty close. Nice pickup. That’s a huge gain in a short period. Nice man, great choice with Walgreens! I just looked and I do have a double up with ABBV. LTC doubled up for a little bit, but came back down to reality with all the other REITs a few months ago. RTN (93.1%) & ITW (88.3%) are getting close if you want to include dividends. Unfortunately I haven’t bought any of those companies in a long time, it’s kind of a double edged sword with the price going up. Thanks! Congrats on your double with ABBV. Those are really impressive gains with RTN and ITW also. You also mention a good point. Now that these great stocks have run up in price, they are more expensive to add to. It will greatly increase my cost basis when I buy more WAG. Since these are all unrealized capital gains and I don’t plan on selling, then the dividend income is more important than any capital gains right now. Very nice! Obviously quality picking and criteria at work. Keep up the due diligence! Thanks! Well, It may have been more luck but I had liked WAG for a while and I took advantage of some short-term weakness. Wow that’s quite a ride up for WAG, and in the face of increased competition from CVS as well. Good Job sir. It is and it was in a fairly short period of time. Thanks, now the problem is buying more at a reasonable price. Congratz on the double. Its a good feeling. I’ve had several doubles: UTG, O, and SBUX. STX currently is getting close for me and with their share buyback policy I have no doubt it’ll happen, possibly this year. Thanks! It is a good feeling even though I care more about dividends. Congrats on your doubles, that’s impressive! I so wish I had held my SBUX. I bought some close to I believe $12-15/share and sold for a quick profit. This was before I was into DG investing though.